Book & a Bomb: UNDER THE LIGHTS Giveaway! It’s time for another book and a bath-bomb giveaway! BLURB FROM BARNES & NOBLE: Young actor Josh Chester has never been sure that acting is for him–he’s mostly interested in the parties and the hot Hollywood girls that come with the job. But he ends up taking a job on the hit TV series Daylight Falls, opposite Vanessa Park, a girl who is immune to his charms and also his polar opposite. Vanessa loves her job, despite her parents’ disapproval. She’s pretty certain about everything in her life, until she meets her new career handler, a gorgeous girl named Bri. Then things start to get a little confusing. Under the Lights features an adorable romance between two young women, all set against the backdrop of Hollywood. As Vanessa confronts her emerging feelings for her handler, Bri, her co-star Josh confronts his realization that the Hollywood scene might not really be his cup of tea. 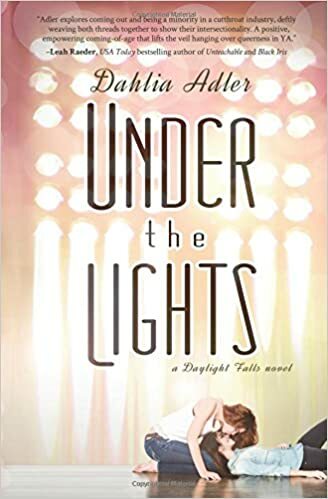 Under the Lights is a story of self-discovery: learning that the person you always thought you were might not actually be the case anymore. What better bath bomb to go with a tale of budding love among Hollywood’s lights than PHOENIX RISING? My thoughts: It’s glittery, it’s magical, and it smells like fruit and spices! What a perfect bath bomb for a romantic YA read that had it’s own dashes of spice and glittery fancy parties! Not an international giveaway, but I will ship to Canada/Mexico! I want to win because that’s my favorite bath bomb but it’s discontinued Dx and I also have been dying to read under the lights!